JAMB suspends workers over N36m swallowed by snake – Royal Times of Nigeria. 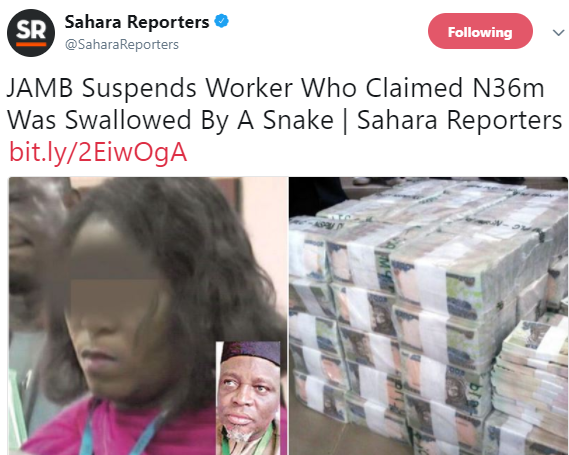 The management of JAMB has said all its staff involved in the case of the mysterious snake that swallowed N36m belonging to the examination body, have been placed on interdiction pending the outcome of the ongoing investigations. It was gathered that a team of auditors was said to have been dispatched to different state offices of JAMB to take inventory of sold and unsold scratch cards and recover the generated money. The woman reportedly told the team that she could not account for N36m made in the previous years before the abolition of scratch cards. It was learnt that Chieshe explained in her statement that a mystery snake sneaked into JAMB accounts office and made away with the N36m cash. The money was said to be from the purchases of scratch cards from JAMB state offices and other designated centres. The Minister of Finance, Kemi Adeosun, had last year, said JAMB for the first time remitted N5billion to the government’s coffers with a promise to pay the balance of N3bn, compared to maximum N3million remitted yearly in the last 40 years. .